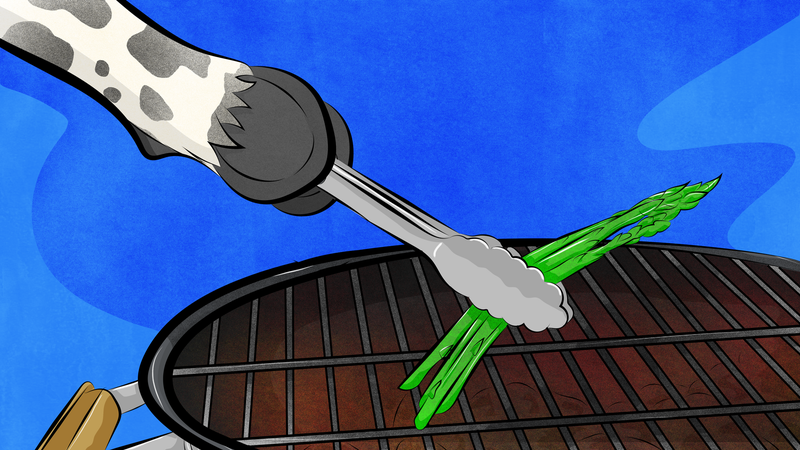 I grew up as a vegetarian, and I still feel a little awkward when I’m invited to a barbecue. Despite happily eating most of the ocean now—and dabbling in a rotisserie chicken on occasion—I can’t help but shy away from the idea of chowing down on red meat thrown on a grill. So, when barbecue season arrives, I end up having to stick to a strategy of sorts. It’s a good routine. I don’t complain about non-meat food being cooked on the same grill as meat; I skip out of conversations asking why I don’t eat most meat (no one likes to be moralized to while chowing down); and I usually grab a slice of pizza or light sandwich before turning up to the main event. Grilled corn is amazing, but I don’t want to be stuck relying on a meal consisting of three cobs on a paper plate sitting next to one of those lonely pepper, onion and zucchini kebab contrivances. However, things are changing with the trend towards eating locally-sourced and seasonal produce—along with shifting views on the amount of meat we consume and initiatives like the Meatless Mondays movement—meaning we’re getting closer to a time when you can claim grill-master status while still keeping it plant-based. Sure, your reaction at this point might be along the lines of, “A barbecue without meat is high treason,” but I’d suggest you’re looking at this all wrong: Think of embracing a vegetarian or vegan approach to barbecuing not as a threat to your traditional beef burgers, but as a way to eat a whole lot more food that you’ve yet to discover. Here’s how you do it. Beyond the grill itself, you don’t need much in the way of an armory of utensils to get started. Tongs and a silicone basting brush are key, and a grill basket helps when dealing with smaller or slender vegetables that might otherwise fall through the grill. (A hastily made aluminum foil contraption will also suffice—just fold up the edges until it’s sort of basket-shaped.) A comedy apron of your choosing is traditional. If you find yourself living in an apartment without an outdoor space—or surrounded by non-optimal grilling weather—you can get in on the grilling action by investing in a cast iron indoor grill pan. Le Creuset is the standard—anything less is just a goddamn shame. These things are great for cooking throughout the summer when even the thought of turning on the oven causes sweat beads to trickle down your back. Just remember the slow and low mantra when grilling indoors—I use somewhere between the 2 and 3 numbers on the stove’s burner. Indoor grill pans are also great for grilling smaller foods and vegetables that might otherwise fall through the grill—think green beans, brussels sprouts and olives. Yes, definitely grill olives. Also, if you’re attending rather than hosting a barbecue, make sure to do the basic prep work at home before turning up to the soiree with food you want to eat. Arriving with a tupperware full of pre-washed, prepared and seasoned vegetables and foods that can be thrown straight on the grill avoids you coming off like a difficult, picky eater who wants the entire event to come to a halt just to accommodate your dietary whims. Considerate barbecue integration is key to being a plant-eater at a traditionally meat-based get-together. Let’s be honest, fake meat is never going to be the star of any barbecue. Meat and fish excel on a grill, but most veggie burgers by themselves don’t. To that end, avoid wasting time with the slew of online recipes promising the secret to the world’s best ever handmade veggie burger—they usually involve buying about 20 random ingredients that you’re never going to use again and still invariably fall apart on the grill. Best of all, because frozen veggie burgers take minimal effort to cook up and gain those all important char lines, you’ll have more time to get on with the more important grilling tasks of cracking open a bottle of your favorite brew and wielding your tongs around like you know what you’re doing. Garlic scape or ramp pesto: Basically, throw some of these seasonal garlicky wonders into a mini-food processor, add some sunflower seeds (cheaper than walnuts), herbs of choice like parsley and basil, a bit of salt, whizz them up, and then pour in olive oil. (Technically, some grated pecorino romano would be a nice cheat against the vegan laws.) This green saucy wonder will pep up any sort of burger, and also freezes easily for later use with pasta. Homemade salsa: Avoid watery store-bought salsa and whip up a batch yourself in about, ooh, literally 60 seconds. Throw canned or fresh tomatoes into the food processor, add chilies or fruit if you want (pineapple and mango are good), onions, vinegar (apple cider is basic, but flavored vinegars are also great), cilantro and salt. Pulse it up a little and you’re in business. Also, if you char fresh tomatoes on the grill first, you’ll have a seductively smokey condiment to make all burgers swoon. Get into seaweeds: Grab a packet of nori sheets (the black stuff sushi rolls are wrapped in), toast them quickly on the grill until they crisp up (maybe about ten seconds each side), and rip them into squares and add to your burger or hotdog, ideally along with a dash of hot sauce, blistered shishito peppers, and some tangy black garlic if you can source it. Also, dulse is magic. It doesn’t taste like bacon per se, but it does impart some of that savory, salty smokiness to each mouthful. You can pick up packages of pre-flaked dulse from most health food stores and Whole Foods these days. It’s equally as vital when topping tacos and sandwiches and will give you that salt hit without skyrocketing your sodium intake. Dulse is the future. Microgreens: Okay, so they sound pretentious, but micrograms like sunflower shoots, broccoli sprouts and pea shoots make for snappier burger toppings than sticking some wilted lettuce between a bun. Try radish microgreens for a heady peppery kick. Fake cheese: Avoid this. Seriously. I bought some Go Veggie American singles the other night while tipsy and it literally tasted like the smell of a packet of silica in a sneaker box. Didn’t melt either. Honestly, it’s good to respect everyone’s personal eating choices, but please don’t bring fake cheese to the barbecue. If anyone tries to suggest grilling a portobello mushroom in lieu of a burger, you have a civic duty to down tongs and leave the barbecue. What they’re really suggesting is a bland and watery mushroom, that at some point was used as a burger substitute seemingly on the basis that it’s sort of the same shape. When it comes to mushrooms, stump up the extra to buy some hen of the woods (maitake) mushrooms. These fantastically intricate looking fungi are a dream on the grill: There’s lots of surface nooks and crannies that cook up just lovely, while the insides stay juicy and moist. Once you’ve flirted with maitakes, the thought of biting into a portobello can be an emotionally traumatic thing. Also, while part of the joy of grilling is the simplicity of taking a handful of food, throwing it on the grill and letting it do its thing, you can also imbue your vegan-friendly fare with a little extra smokiness by grinding up some dried porcini mushrooms in a coffee or spice grinder and using them as a special seasoning. The real key to a successful vegan barbecue is changing the way you think about vegetables. Instead of relegating them to side dish status, turn them into the main event. Wonderfully, you can pretty much place any vegetable that’s in season during the summer months onto the grill and, most times, the results are a charm. Beyond the usual grilled suspects of summer squash, tomatoes, corn and eggplant (remember to salt it before grilling to extract as much of its water as possible), try giving a chance to vegetables whose slightly bitter or off-kilter taste you might otherwise avoid — you’ll be pleasantly surprised at how they go through a makeover on the grill, releasing all sorts of sweet and flavorful goodness as they begin to crisp and caramelize. Okra chars up on the outside while drying out inside, thereby eliminating the slime factor that causes many people to shun the fabled ladies fingers. Big chunks of endive and radicchio lettuces are a treat, revealing themselves to be smokey with crispy edges on the grill. English peas in the pod coated with oil and salt become a twist on edamame, as you tease the peas out while sucking down on the salty pods. The often maligned beet is a champion of the grill. They take a little more work—you’ll want to grill them inside an aluminum foil pouch until they can be pierced with a knife, before throwing them back on to get those all important grill lines—but they transform into super sweet and smokey wonders. Using golden and chioggia beets (with their candy cane stripes) adds visual variety to the spread. Japanese turnips, simply cut in half and grilled, will add crunch to your smorgasbord. So, if it’s currently at the farmers market-and, it seems, is green in color—take the plunge and throw in on the barbie. Also, because vegetables thrive on the grill, keep your seasonings to a minimum: All you really need to do is lightly brush them with some grape seed oil and then liberally dress them with salt and pepper. Other spices are optional—I sometimes use sumac to add some zest to zucchini—although if you want to fancy things up definitely use truffle salt. Oh, and forget reading up on recommended cooking times for various produce—this whole endeavor can be a crapshoot that depends on the whims of your grill, your heat source, the freshness of your produce, and how well you dried your produce (if you washed it at all). Just use your hunger faculties: If it’s charring and it looks ready to eat, it probably is. Finally, if you do one preparatory thing to endear yourself to the barbecue’s guests, it should be cooking up a ton of caramelized onions. Cut large onions in half, slice, then add to a skillet with a touch of oil, a dash of salt and cook over a low setting for something like 45 minutes to an hour. Do not rush the onions. Repeat: do not rush the onions. Largely leave them alone, other than checking in every ten or so minutes to throw in a splash of liquid (beer, wine, balsamic vinegar, stock, even water) and use a spatula to scrap up the burnt bits at the bottom of the pan. Eventually, the onions will begin to turn golden brown as they caramelize. Alchemy has been achieved. Your magic onions will keep in the fridge for about five days, so rustle up a big batch, then simply reheat them on the grill on a sheet of aluminum foil or in a grill pan. Be the person at the barbecue with an endless supply of caramelized onions and everyone will love you, no matter what sort of burgers they’re chowing down on. Phillip Mlynar lives in Queens, NYC. When not writing about rappers for Red Bull Music Academy, NYLON, and the Village Voice, he muses on the feline form for Catster. His Twitter claims he’s the world’s foremost expert on rappers’ cats.